We do not offer birding day trips. We offer birding in Khao Sok National Park as part of our nature and wildlife tour on the lake. We also offer multi-destination birding trips for groups of four or more in other destinations. Birding takes place in all sorts of environments. Some birders prefer walking through forests or jungles. Some birders fancy seeing birds in a beach atmosphere. One of the easiest and most productive ways to watch birds is from the comfort and convenience of a kayak or canoe. Did you realize that there have been more than 1,000 species of birds recorded in Thailand? 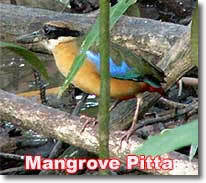 Over 200 species of birds that have been recorded in Thailand’s mangrove forests! Close to 400 species of birds reside in or visit Khao Sok National Park. 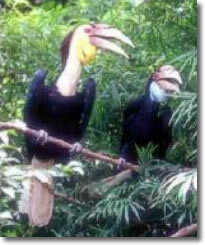 Hornbill sightings are actually common in Khao Sok! You're likely to see plenty of exotic tropical birds on our trips to Phang Nga Bay where mangrove forests are common. Kingfishers - There are 86 species of kingfishers worldwide. Thailand has 15 species. Most of them have bright plumage. Kingfishers typically perch in trees in an upright exposed posture. They often plunge-dive in the water for food. They eat fish, shrimp, other small aquatic animals, insects and occasionally small terrestrial animals such as lizards. Some species, such as the White-throated kingfisher inhabit inland areas. They’re commonly seen around rice fields looking for lizards, frogs, and insects. They’re absolutely stunning when the sunlight hits their beautiful shiny blue feathers. Hornbills - Hornbills are primarily frugivorous (fruit eaters) though they will take small reptiles, insects, and even other smaller birds during molting or when rearing young. Hornbills make their nests in holes in trees. Dipterocarpus, massive straight-trunked trees, are a popular species for hornbills to build their nests. If you see hornbills, there is some nice jungle somewhere nearby. The female seals herself in a hole using mud and droppings. This helps prevent predation. The male's role is that of a food provider. He will bring the female and their young food until the young are ready to leave their transitory home.